F R E E S H I P P I N G if you " B U Y I T N O W " at the Listed Price! Produced this one time & never re-issued. 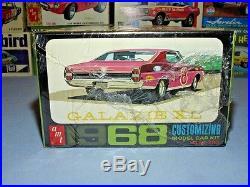 For your consideration is a FINE & VERY RARE example of a 49 YEAR OLD Vintage AMT Annual Issue 1968 FORD GALAXIE XL HARDTOP "GO GETTER" 1/25 SCALE #6128-200 Plastic Model Kit. 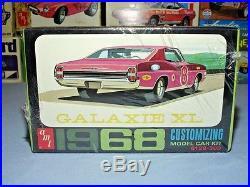 This 1968 copywrited model kit was produced by the. AMT Corporation of Troy, MI. During some of the many makeovers & takeovers of the long & storied AMT model company's existence. This kit is an original issue. 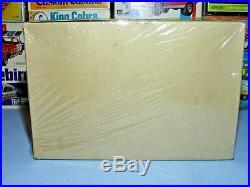 UNBUILT FACTORY SEALED VINTAGE AMT MODEL KIT. The photos should tell you the story. Kit features include: White molded plastic parts, Brightly Plated Chrome Parts, Vinyl Rubber Tires , Clear Window Glass, Clear Red Tail Lights, Decal Sheet & Instructions Sheet. The condition of this kit is what I would consider EXCELLENT!! ALL OF THE PARTS I WOULD ASSUME TO BE PRESENT & ACCOUNTED FOR AS THIS IS STILL FACTORY SEALED IN THE ORIGINAL SHRINK WRAP FROM THE LATE 1960's!!! WHAT YOU SEE IS WHAT YOU GET!! This has the original crinkly brittle plastic & of course it is trying to separate on the sides just like late 1960's AMT kits are known to do, but it is still hanging on VERY WELL & displays EXCELLENT!! I would say it would be hard to find one nicer than this especially a kit of this age. Take NOTE, This is not some reshrink job like some critics have mentioned from time to time. The box lid is SUPER CRISP & CLEAN & ALMOST PERFECT UNDERNEATH THE CLEAR PLASTIC. 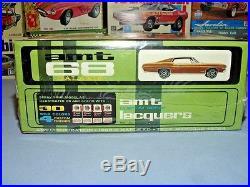 OVERALL A VERY NICE & VERY RARE VINTAGE AMT MODEL KIT. THIS IS ONE OF MY FAVORITE VINTAGE AMT KITS!! Here is a rare chance to score this GREAT kit!! Don't let it get away!! This VINTAGE kit certainly has the potential to increase in value. I hardly ever see kits like this diminish in value over my years of collecting. Please ask questions if there is something that you cannot see. THIS KIT MAKES A VERY NICE DISPLAY PEICE IF YOU DECIDE NEVER TO BUILD IT!! I DO HAVE OTHER RARE KITS THAT I MIGHT BE WILLING TO PART WITH. IF THERE IS ANYTHING THAT YOU MIGHT BE LOOKING FOR, DON'T HESITATE TO ASK ME & I WILL SEE IF I HAVE IT! " B U Y I T N O W or Best Offer ". If you are not happy with this kit, Just contact me to work out the details of it's return. 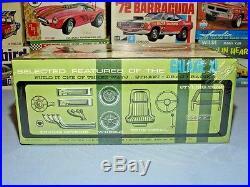 NONE OF THE BOXES OR KITS THAT MAY BE PICTURED IN THE BACKGROUND ARE PART OF THIS SALE LOT. Thanks Very Much For Looking! That being said, I will suspend international activity if I encounter fraudulent buyers. You know what they say; ONE BAD APPLE CAN SPOIL THE BUNCH!!! 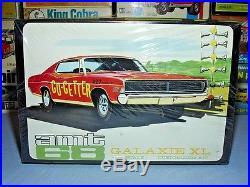 The item "AMT 1968 FORD GALAXIE XL GO GETTER #6128-200 1/25 68 MPC RARE SEALED MODEL KIT" is in sale since Sunday, September 10, 2017.